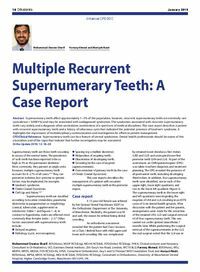 Abstract: Supernumerary teeth affect approximately 1&#8722;3% of the population, however, recurrent supernumerary teeth are extremely rare (prevalence = 0.0001%) and may be associated with undiagnosed syndromes. The syndromes associated with recurrent supernumerary teeth vary widely and a diagnosis often necessitates involvement of a spectrum of medical disciplines. This case report describes a patient with recurrent supernumerary teeth and a history of sebaceous cysts that indicated the potential presence of Gardner’s syndrome. It highlights the importance of multidisciplinary communication and investigation for effective patient management. Clinical relevance: Supernumerary teeth can be a feature of several syndromes. Dental health professionals should be aware of this association and of the signs that indicate that further investigation may be warranted. Author notes: Mohammad Owaise Sharif, BDS(Hons), MJDF RCS(Eng), MOrth RCS(Ed), FDS(Ortho) RCS(Eng), FHEA, Clinical Lecturer and Honorary Consultant in Orthodontics, UCL Eastman Dental Institute, 256 Gray’s Inn Road, London, WC1X 8LD, Farooq Ahmed, BDS(Hons), MSc, MDPH, MFDS, MOrth, FDS RCS(Orth), AFEA, Consultant Orthodontist, Guy’s and St Thomas’ NHS Foundation Trust and Mariyah Nazir, BDS(Hons), MPhil, MFDS RCS(Eng), MOrth RCS(Ed), FDS(Orth) RCS(Eng), Consultant in Orthodontics, University of Manchester Dental Hospital, Higher Cambridge Street, Manchester M15 6FH, UK. Objective: To highlight the possibility of recurrent supernumerary teeth and their association with syndromes, with specific emphasis on the signs of Gardner’s syndrome.